ArcRisk encompasses a significant fieldwork component that has generated a wide array of new data, relevant for the transfer and fate processes of the selected substances in the Arctic. The acquisition of new data from this fieldwork complements recent fieldwork studies conducted as part of the International Polar Year (IPY) and involved Canadian ArcRisk partners. Fieldwork was carried out within the ArcRisk project to address abiotic processes, levels of POPs and their transfer processes in marine and terrestrial food chains. Relevant human food items, such as fish, whale and seal were analysed as well. These empirical data were thereafter used for modelling validation as well as for effects and exposure assessment. The sampling campaigns were focused on the European Arctic and the European mainland. To understand the fate of pesticides from secondary sources, like glaciers and snow caps, the Godthåbsfjord (Nuuk, Greenland) was chosen as study area for meltwater. Plankton from the waters around Svalbard were analysed for chiral pesticides to gain more knowledge about the effect of changing oceanographic conditions (water masses, ice cover etc) on the fate of pesticides. Sampling of terrestrial and marine biota took place in northern Norway and Greenland through access to local markets and/or hunters. All data from air and deposition measurements comes from national monitoring programs which have long sampling records of POPs. Data from a latitudinal transect from the Czech Republic (‘industrialized Europe’), Finland/Sweden (‘sub-Arctic remote’), and Svalbard (‘High Arctic’) has been used. To investigate air-surface exchange processes and atmospheric transports, snow, ice and water have been sampled in Greenland, Svalbard and northern Norway. Surface snow from marine ice floes have been collected during ship based field campaigns in the Barents Sea. The fate of contaminants in snowpack has been investigated during field studies in northern Sweden and Norway. Contaminant deposition associated with separate snow layers and corresponding particulate matter was measured and related to the snowfall history and air mass origins. Ship based sampling campaigns took place in the ice covered waters and fjords around Svalbard during spring 2011 and 2012. Organisms and relevant human marine foodstuffs samples collected within the ArcRisk project are summarised in the table below. 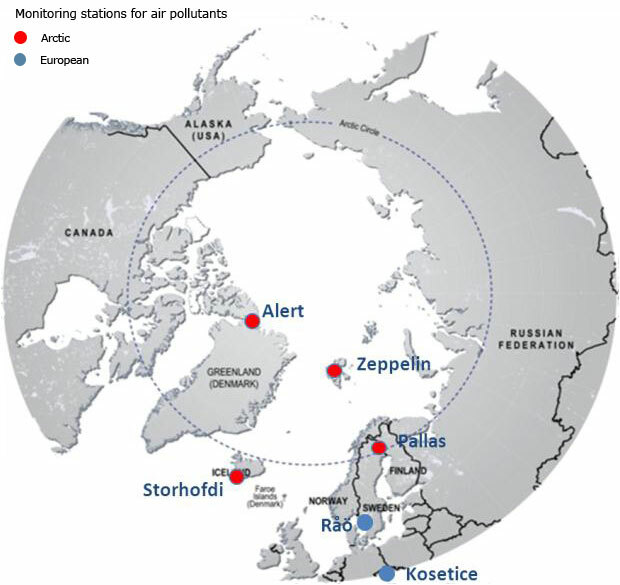 Plankton samples from Svalbard waters were available from the IPY project COPOL (Contaminants in Polar Areas) for enantiomer selective analyses. Additional plankton samples were collected during ship based field campaigns. Relevant human dietary items such as fish and marine mammals were purchased in the local market in Nuuk, Greenland. 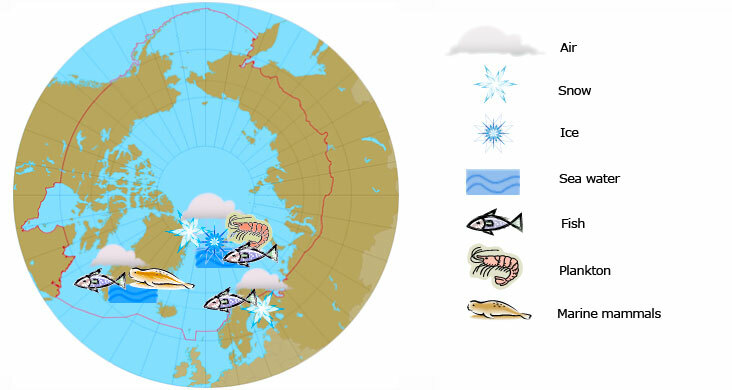 Halibut and shrimps were collected in northern Norway, and Arctic char (Salvelinus alpinus) was collected from Svalbard. Reindeer tissues were collected by local hunters in Svalbard. The tissues were analysed for several POPs. Ice associated plankton (pooled samples, whole organisms). Gammarus wilkitzkii, Apherusa glacialis Eastern MIZ 10 pooled Collected during R/V Lance cruise in August 2010 by Norwegian Polar Institute. Coastal Svalbard 10 Samples available from 2008, Additional material collected in Rijpfjorden, October 2010. Commercially available from the markets (Tromsø). Greenland samples, collected from local market (summer 2010). 6 Collection from local market in Nuuk (summer 2010). Svalbard reindeer (Rangifer tarandus platyrhynchus), liver, blubber, muscle tissue Svalbard 30 Provided by local hunters. The chemical processes related to the impact of UV-light and the fate of POPs in snow and ice is poorly understood. To gain more understanding about these processes, artificial snow was made. Contaminated artificial snow, prepared by shock freezing of the corresponding aqueous solutions or by adsorption of gaseous contaminants onto the surface of pure snow, can be utilized for environmental studies. Contaminated snow samples were prepared by various methods: by shock freezing of the aqueous solutions sprayed into liquid nitrogen or inside a large walk-in cold chamber at −35 °C, or by adsorption of gaseous contaminants on the surface of artificially prepared pure or natural urban snow. It has been demonstrated that artificial snow can be used to simulate chemical processes of trace contaminants that occur in natural snow and stratospheric cloud particles (Kurková et al., 2011, Ray et al., 2011).